Topical retinoids come in the form of creams, lotions and gels containing one or other group of medicines derived from Vitamin A. They have been proven to be very effective at unblocking pores of current acne spots and preventing new blockages from developing. Retinoids can be either over-the-counter retinol or prescription-strength Retin-A. They treat acne by correcting the oil chemistry on the skin, thereby helping stop dense sebum (natural oil produced by the skin) from getting stuck within the pores. Without oil deposits, bacteria can’t grow and cause blemishes or inflammation. Can Topical Retinoids Cure Acne? Topical retinoids such as retinoid creams and gels are effective treatments for suppressing mild to moderately severe acne. 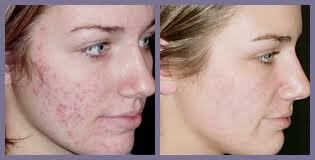 They also reduce acne outbreaks by preventing dead cells from clogging pores. By clearing acne and reducing outbreaks, they may also reduce the formation of acne scars. The effect is often noticeable within a few weeks, but it may take 6 weeks or longer before improvement occurs. Bonus Benefit Of Topical Retinoids: They have been proven to enhance collagen production and fill-up fine lines, making them a good treatment if you’re dealing with acne and wrinkles together. How To Use Topical Retinoids? Read and follow the instructions given on the labels of the over-the-counter retinoid products. Generally, you need to smooth the retinoid gel or cream over the skin once a day 20 to 30 minutes after washing your face. In order to avoid irritation, you can apply every other evening to start, gradually working up to nightly use. Since retinoids can make your skin sensitive to the sun, dermatologists recommend using them at night and also be careful about wearing sunscreen during the day. Tip: During the first few days of its use, you may notice redness, peeling of your skin, or worsening of your acne. You can minimize this by using the product every other day until your body gets used to it. Retinoids when applied topically can irritate the skin, particularly when they are used first time and especially so in case of those with sensitive skin leading to stinging. Its excessive use results in redness, swelling, dryness, peeling, blistering, and sensitivity to sunlight in treated areas. By peeling off the top layer of skin, they may increase the chances of sunburn. Some people have reported a flare of acne in the first few weeks of treatment. This generally settles with continued use. (i) Use topical retinoid on alternate nights at first. If you have sensitive skin, wash it off after an hour or so. If it irritates, apply it less often. If it doesn’t, try every night, and if possible twice daily. In most people, the skin gradually gets used to it. (ii) Apply a sunscreen with SPF of at least 30 to exposed areas of your screen if you go out during the day. (iii) Don’t let it go into your eyes or mouth. (iv) Apply a little bit to all the areas affected, and spread it as far as it will go. Never use more of the product or use it more frequently than what your doctor prescribes or the package label says. Doing so will not increase its effectiveness, but will increase side effects. (v) Be careful if you are using any other topical acne treatment – check with your doctor whether you should stop this. (vi) Use a moisturizer along with topical retinoids. Doing so will reduce skin drying without interfering with the product’s effectiveness. (vii) To reduce stinging, apply it to dry skin, i.e. at least 30 minutes after washing. (viii) If your skin turns scarlet and peels badly even with cautious use, the retinoid may be unsuitable for your skin type. (ix) Pregnant women or women who are planning on becoming pregnant should avoid use of retinoids. Often the doctors recommend combining topical retinoids with an antibiotic for faster acne treatment and its cure. But we should never go for any combination treatment without consulting a doctor first. I discovered your Topical Retinoids Cure For Acne And Scars. I tried your tips and they have worked for me. Wow! The effect is very visible. The very first time I heard about retinoid from a friend of mine, I thought of not trying it out because I don’t have any idea about what retinoid is. It took me a while to find good products for my skin but it’s worth it. I know doctors who recommend retinoid for the skin as well. Thank you for sharing this!